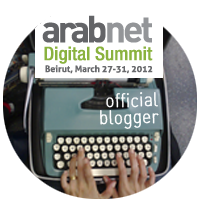 ArabNet Digital Summit 2012, the biggest event for web and mobile in the region, is around one month away. Last year’s summit brought over 1000 attendees, 100 speakers, featured 18 panels and 17 talks, in addition to 20 entrepreneurs pitching their ideas and startups. The Digital Summit will also include ArabNet’s annual competitions: the Ideathon and Startup Demo. The Ideathon aims at turning bright ideas into functional products will introduce the top 20 entrepreneurs and startups in the region, exposing the latest in digital entrepreneurship and giving entrants the chance to win big cash prizes and the attention of investors, incubators, and developers.